Here we are nearing the end of August and it’s looking like being the worst August for sales that I’ve ever had! How can I have survived so well during seven long years of world recession, only to be thwarted by Britain’s sudden and dramatic exit from the EU! Naturally I have only assumed this outcome from all the facts I have accumulated over the years. The British are definitely my biggest customers, followed closely by the Scandinavians, Americans and Europeans. Last year was a record August for me, the majority of artworks were sold to the Brits, primarily because the pound was so strong and travellers got lots more Euros. This year it’s a completely different story and from what I’m seeing, nobody appears to actually have any money to spend! It’s not only me that has experienced poor sales either. The Excursion desk next to me have noticed a drop in bookings and even my friend Lisa, whose massage station at the other end of the beach in Almyrida was bombed out last August – has been twiddling her thumbs with nothing to do!! Local Restaurants and Tavernas have also been moaning, so why is this? It’s just not as busy in Almyrida this August as it usually is. Did many Brits cancel or decide not to book after Brexit? Whatever the reasons and having said all this, it’s my smaller artworks that have suffered most. 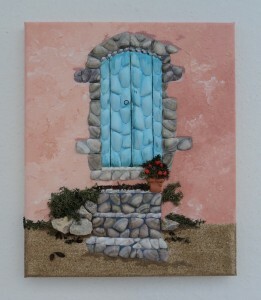 I sold out of my Greek Blue Door design and only have one ‘Children in Sun Hats’ canvas left. 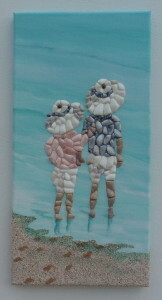 I have also sold some artworks that would never normally see the beach stall. As I was unable to have my exhibition in Chania this year, I decided to bring along the odd larger and more expensive canvas – to see what reactions I would get from the visitors to Almyrida this summer and this turned out to be the right decision. There is still plenty going on in my little world, keeping me positive and optimistic about all things! I have been enjoying some of the wonderful pleasures life has to offer here on Crete. I went on a boat trip, invite courtesy of Yorgo’s Adventure Boat Trips. I have met some really lovely people who work the Excursion Desk next to my stall and every summer they all meet up for a few hours on Yorgo’s speedboat. We visited several different coves along the opposite coastline to Almyrida. Lots of swimming and snorkelling was the plan and that’s exactly what we did! Great fun! I finally got around to booking my Fusion Massage at the Spa on the Almyrida Residence Hotel’s Roof Garden. It was a ‘thank you’ gift from Emma and Ash and a real treat for me! Ash’s parents also received the same gift and had theirs after the wedding so mine was long overdue. I opted for the ‘deep massage’ rather than the ‘gentle’ one because I wanted it to do me some good – but it hurt! Hey, ‘no pain, no gain’ is what they say! All those hours spent with my head down, working on my artworks – the guy who did my massage really loosened me up and got rid of all the knots in my back, shoulders and neck. I felt great afterwards – if a little sore! I’m so enjoying all the benefits of my new home, having lived here now for over six months. Without doubt it has and is improving the rich quality of my life even more! I am loving the peace and tranquillity of my surroundings; loving the sounds of nature going on around me – the sea, the wind, the birds and seagulls, sheep and even horses! I’m loving my newfound privacy because I have no close neighbours – an experience and a pleasure I’ve never had. I can honestly say that this is the most wonderful place I have ever lived in! My friend Jenny came back to Crete for a week, accompanied by her Grand-daughter Alicia, which was a nice surprise. Jenny has a charming and beautifully renovated apartment right on the harbour front in Chania. Many of my artworks are hanging there and now she has just purchased two more. The first is a large triptych of a Greek archway and urn and the second is my fisherman and his boat. So I am thrilled about this and I know that these artworks will look fabulous in Jenny’s harbour-front apartment – now almost a mini gallery for my seashell mosaics and natural collages. Every time Jenny returns to Crete she always arranges a private boat trip and normally I can’t make them because of work commitments. However, because I haven’t been selling as much in August this year, I was happy to accept her invitation! Saturday started brilliantly, as I strolled along the harbour front on my way to Jenny’s apartment at around noon. I noticed a large group of people looking into the water just near the ‘shell boat’ and knew immediately that it was Harry they were looking at! 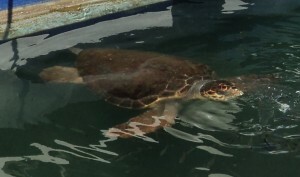 Harry is a seventy year old Sea Turtle and I first saw him right there about two years ago when David and I were exhibiting in the Mosque. He’d come back and it was truly wonderful to see him again in all his glory and so close up. My photos just don’t do him justice! Speeding along in luxury! I was amazed by how fast we went! After a brief catch-up, Jenny, Alicia and I strolled back along the harbour to a really traditional Greek restaurant, where Carolyn joined us for a light lunch. Carolyn looks after Jenny’s apartment and we have all become firm friends. Just before 3pm we made our way past several boats to the one Jenny had hired and wow – it just blew me away! I was expecting a small speedboat but Jenny doesn’t do things by halves. This was a large, sleek and luxurious Italian speedboat and was crewed by two gorgeous Adonis-type Greeks. Funnily enough, one of them was actually called Adoni!! 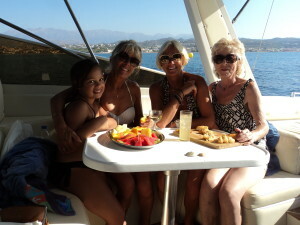 On board the four of us were waited on with platters of fresh fruit and pastries, ice-cold water and wine. So this is how the other half lives?! What an indulgence! Alicia and I get ready to do some serious snorkelling! Alicia is nine years old and honestly, she’s like a little mermaid; she loves snorkelling and so do I. Jenny and Carolyn didn’t want to snorkel and so I spent lots of time in the water with Alicia. We would spot the odd cockle shell lying on the seabed and Alicia would dive down to retrieve it. 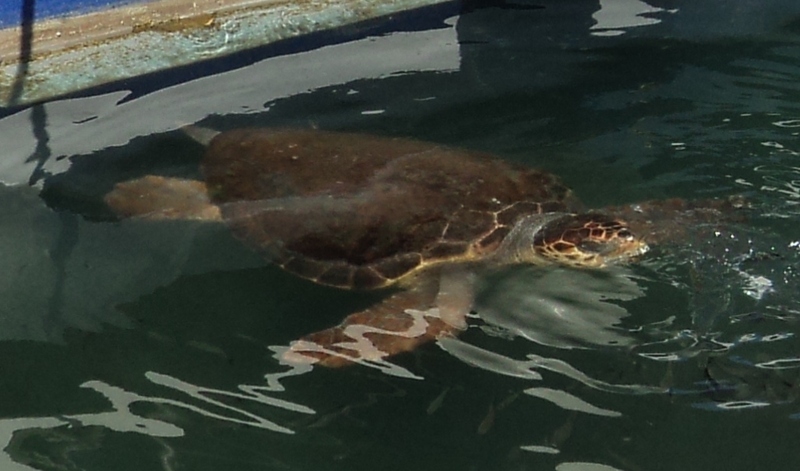 We anchored at several places and the last one was on our way back – a little island not far from Chania harbour. We all swam ashore to explore. 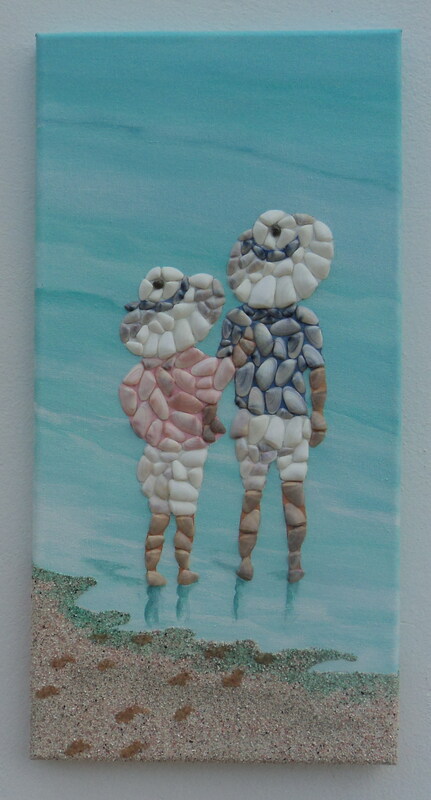 On the beach we found some seashells which we collected in a bag. I wish to stress that I never collect a shell that is live – no matter how beautiful it may be. I have a deep passion for nature and only wish to showcase and preserve its beauty through my artworks. We were on this amazing speedboat for about six hours in all and we watched the beautiful sunset from the luxurious deck, just before 9pm. It was a wonderful day and a thoroughly enjoyable experience! Thank you, Jenny! As Jenny departed on the Tuesday, so my sister Annette and brother-in-law, Ian arrived and they are currently staying at the Almyrida Residence Hotel for a week. Having just gone through the trauma of breast cancer treatment, Annette and Ian needed some quality time out and they knew they were coming out during my busy period, so opted for the hotel stay instead of mine. Last night I collected them from the hotel and brought them up to see my new home and to enjoy some pre-dinner drinks. 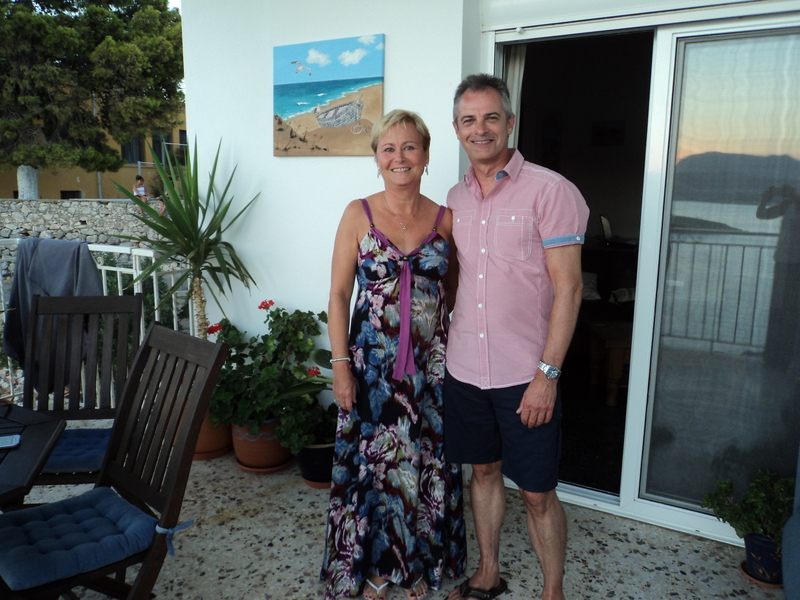 We spent a very pleasant couple of hours, where they admired the views from my balcony, before we headed back down to Almyrida and dinner on the Residence Roof Garden. We had a lovely meal and plenty of time to relax and catch up on all our news. I really hope the weather improves for Annette and Ian’s last few days as it’s been a little unsettled lately, with lots of cloud and rain threatening but not actually materialising. Nevertheless, I could not take the risk and so I didn’t even sell on Friday! But actually this change in weather is a welcome relief for those of us who live here! So I have been enjoying working in cooler temperatures, because up until now, we have had a long and very hot summer. Today – because the weather has been a bit iffy lately – I’ve had a rare opportunity to watch clouds from my balcony sofa. Such a vast blue sky lies above me, interspersed with clouds ranging from brilliant white to mid-grey. I am lying here fascinated as I watch them constantly changing to form different shapes and shades; the sun weaving in and out between them. Quite simply put – Nature’s giant canvas, creating beauty as I watch! 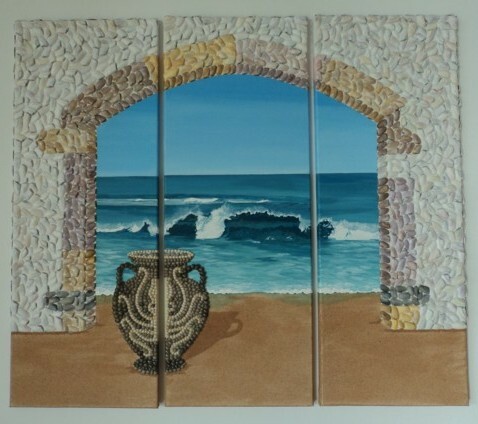 This entry was posted in Blog Posts and tagged Almyrida, Chania, Seashell Mosaics by micmaryjo. Bookmark the permalink.